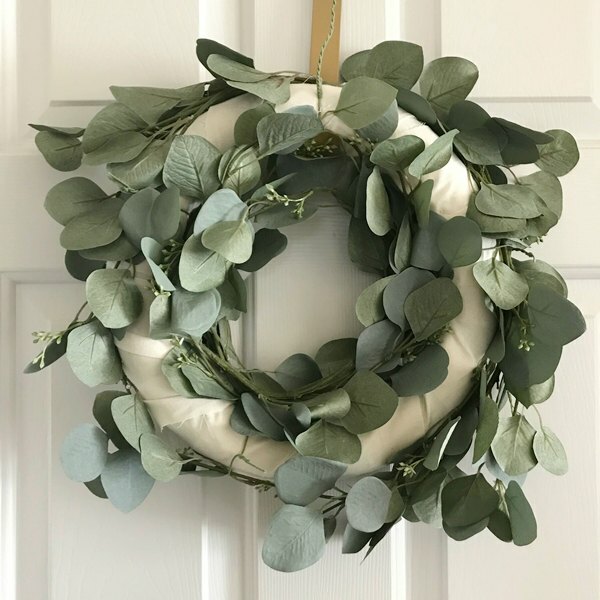 Eucalyptus stems make such pretty wreaths and while they are lovely, they can be pricey. Plus, the process of drying the stems is time consuming. The next best thing? 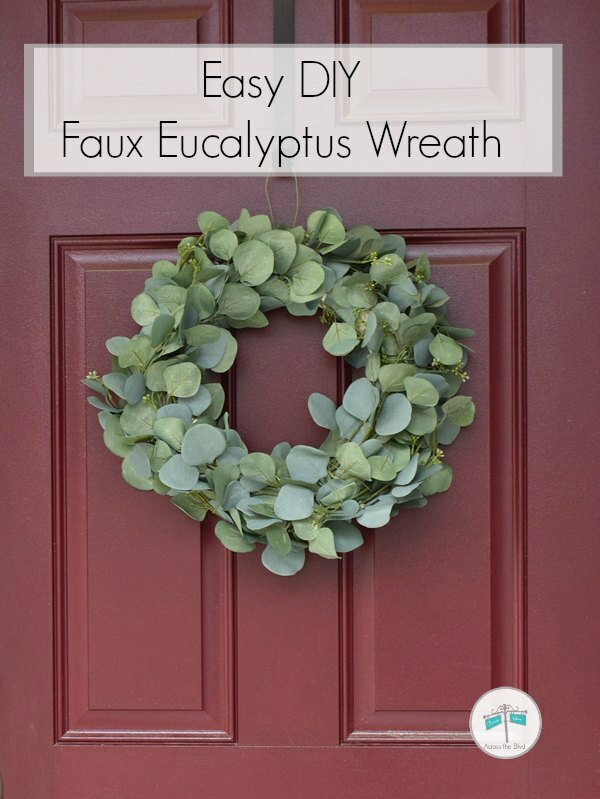 Make an Easy DIY Faux Eucalyptus Wreath that is budget friendly. 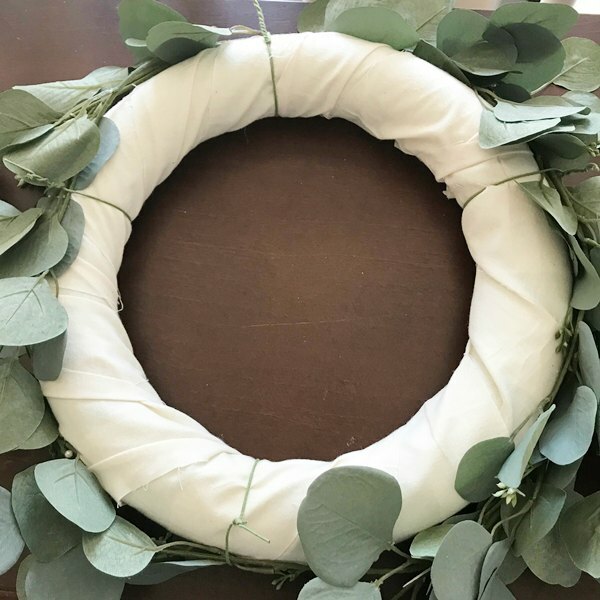 While we were busy giving makeovers to several furniture pieces for Gloria, and styling lots of rooms in her new home, she also mentioned that she wanted a eucalyptus wreath. She had thought about using real stems and going through the process of drying them to use for a wreath. After doing some research, we found that the process to dry them is pretty time consuming. The cost of them can get high, too. 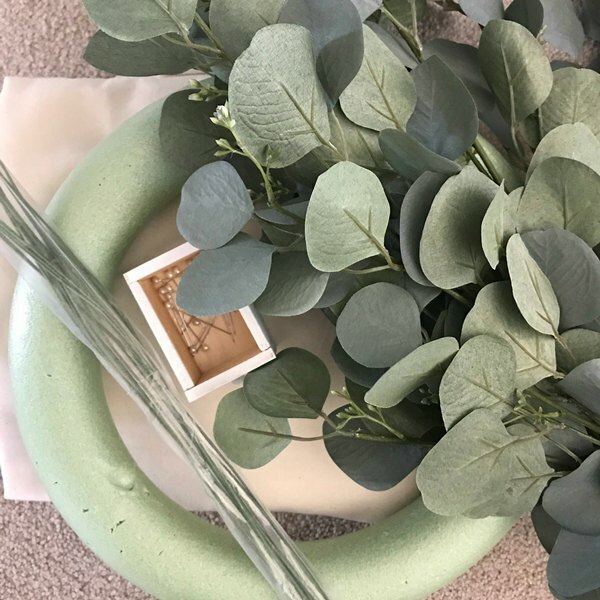 I don’t purchase many florals from Walmart, but when I spotted faux eucalyptus stems there for a reasonable price, I knew they would be the next best thing to using real stems. The price there was less than I had seen on line or at any craft store. I bought six of them, but ended up needing an additional four to complete the wreath. I repurposed an old foam wreath that I had deconstructed at some point. 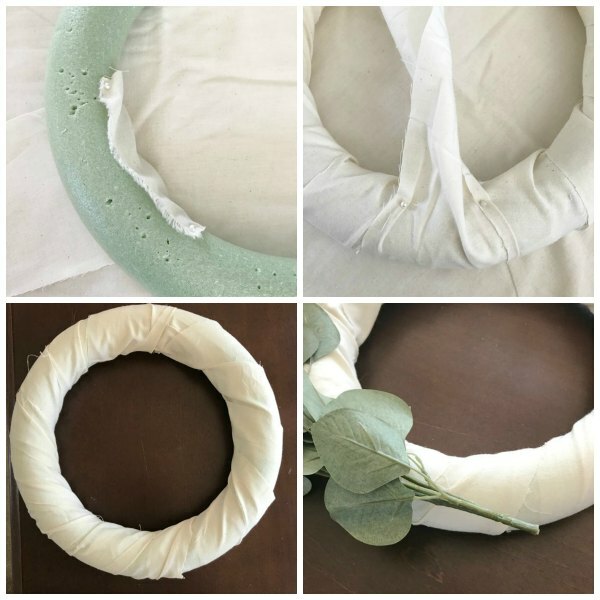 I had the fabric which is a soft off white cotton and it worked well as a covering for the wreath. Any fabric would work. Use what you have. I cut the fabric into one long strip, but if yours isn’t long enough for that, use multiple strips. I began by pinning one end of the fabric with two ball head pins and wrapping it so that it overlaps around the wreath. Once I had the wreath covered, I used two more pins to hold it in place. 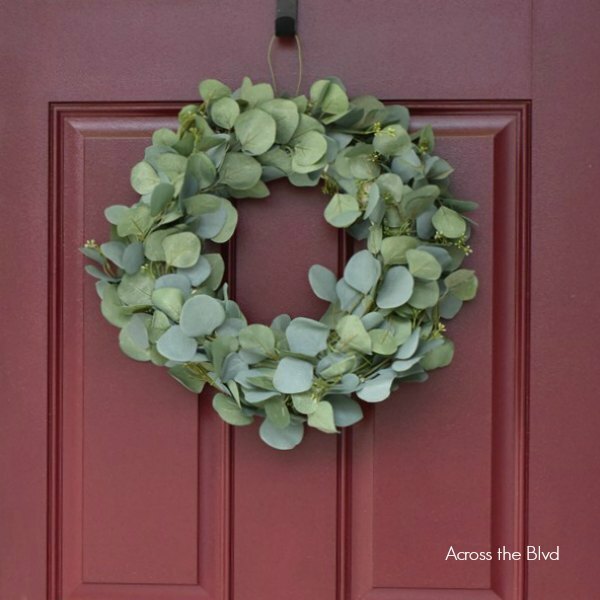 As the wreath began to fill up, I put it on a door hanger to finish it. This helps to let me see which spots need more stems and where adjustments need to be made. I continued layering in the stems until I was pleased with the overall shape and fullness. 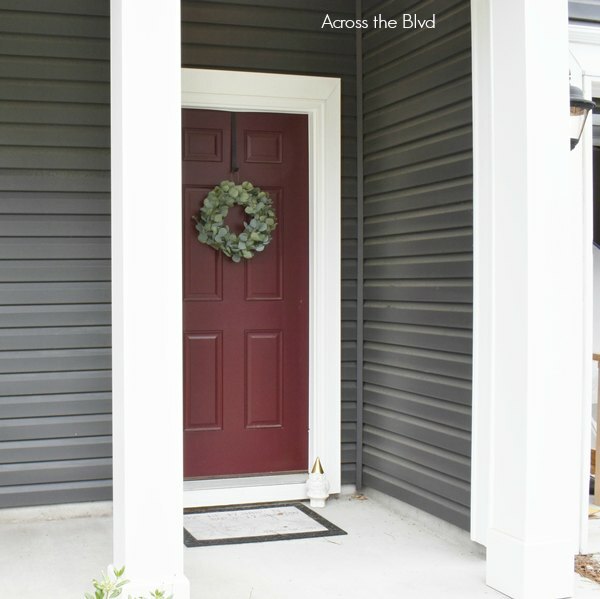 Gloria was very pleased with how the wreath turned out and it looks great on their burgundy front door. 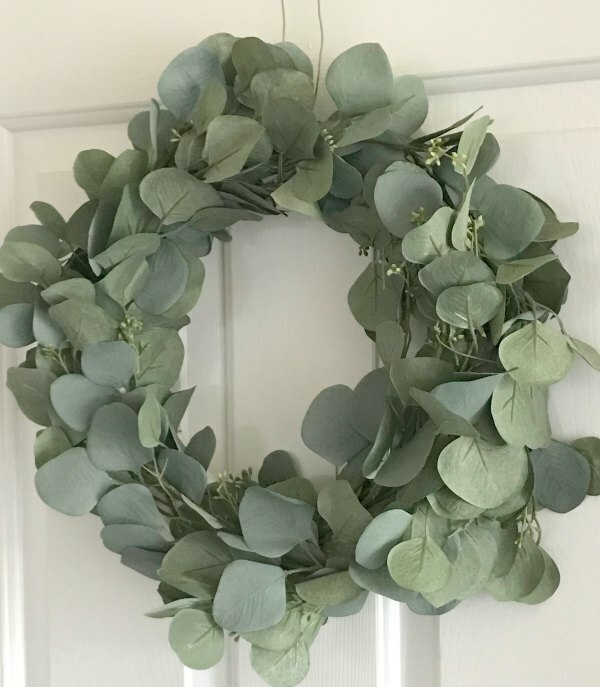 While Gloria may decide to make a eucalyptus wreath using real stems at some point, this one was made in under an hour and was in place to welcome their guests to their engagement / house warming party! It goes well with her farmhouse style decor. You might also enjoy these spring decor ideas! Beautifully created, Beverly – a labor of love! Gloria’s door looks pretty and very welcoming! Walmart sometimes surprised us with really great craft buys! Thank you, Gail! I was happy to make it for her. Yes, sometimes there are surprises there. Just lovely, Bev! And great tutorial! Thanks, Julie! It was really simple to make so I wanted to pass that along. Beautiful wreath I want one just like it. I am pinning and adding to my to-do list. Thanks, Kippi! I appreciate the pin. 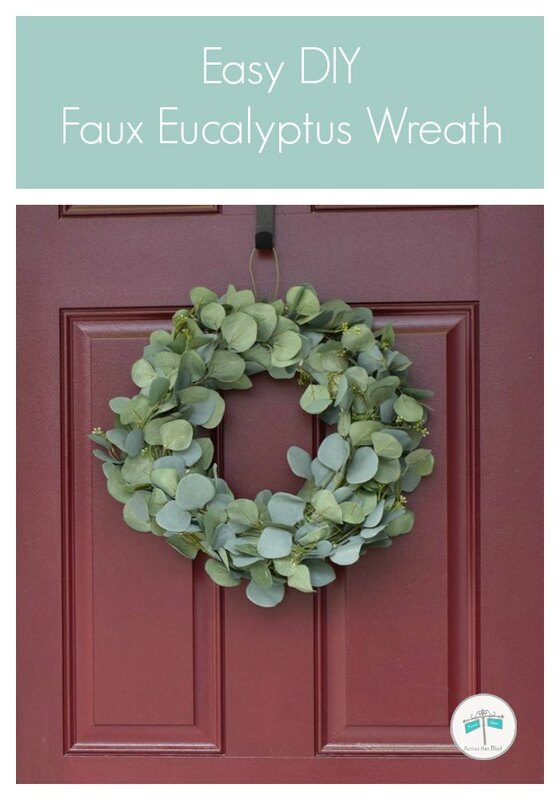 It really is an easy wreath to put together. Well done. It’s a great welcome piece on the door. Thank you, Michele. I loved how easy it was to put together. This looks so fresh and pretty for spring! love it. Thanks, Hillary! Gloria is enjoying having it on her door.